The media, advertising and interactive world has undergone a sea-change in the past twenty-five years. As organization structures have started to become increasingly complex, teams have transformed drastically. Budgetary allocations have altered, along with firms of various sizes. The imperative is to create a more integrated campaign across channels, and it could revolve around any number of traditional, non-traditional media, social networking sites or multiple other venues. Media planning is now expected not just to optimize opportunities, but also come up with innovative ways to encourage customers. The goal is to achieve engagement with many members of the target audience, and to convey messages that motivate intended actions. Online campaigns can be effective and efficient, but are unlikely to generate broad engagement that advertisers may require. Intensity (the number of touch-points) gradually increase. Most analysts concur that television has the maximum engagement of all mediums. A typical campaign can achieve 20% more than print, 60% more than radio, and 400% more than an online medium. Despite what pundits claim, according to some analysts, television advertising has not declined significantly, as consumers shift their media time to online venues. A well-integrated creative concept across television and print campaign can boost overall linkage levels, and create visibility across channels. Media spending has increased astronomically.Whether you like it or not, the number of platforms has proliferated. Sophisticated systems can track every interaction, build in functionality, and update company staff on every interaction in the social, voice or related spaces. Meaningful campaigns incorporate overall engagement and ensure persuasive impact. The real challenge for advertisers is to find how campaigns work. A multi-media campaign involves press relations, events, social networking etc. Defining the target customer is half the battle won. Clarify what you want the consumer to do, and the medium that delivers the act. Find the best media (a mix of more than 1) to communicate the message, reach your target, and specify how it will be delivered in any medium. 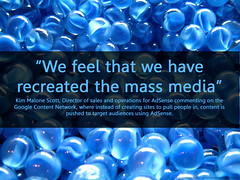 The use of multiple media can help generate accuracy of data leading to targeted campaigns, and increased lead success. Also, greater visibility of data helps decision-making. Traditional platforms are now evolving, and there is more need for two-way communication and interactivity. Most branding parameters have to be carefully considered when it comes to assessing how messages are delivered. Campaign metrics have to be assessed when it comes to print, online, and email. Guerilla marketing, in which unconventional means such as graffiti, sticker bombing, flash mobs are used can help the overall multimedia campaign effort. Also for an experienced marketer, getting to the social network can be positively beneficial. Any offbeat idea using a mix of different sources can potentially attract users. In a fickle world, people can be driven by any motivation, but arresting multimedia campaigns have the potential to garner attention. Research also indicates that simultaneous consumption of television and online mediums have facilitated growth of the brand. Multimedia campaigns get more response rates than single-channel events. Two distinct markets with own strengths and rules are now amalgamating to create a richer experience. Online streaming is becoming increasingly popular around the world, with live sport, music, or webinars for a worldwide audience. A compelling digital universe and flexible bandwidth infrastructure help create campaigns that meet brand objectives. Social media campaigns are like traditional advertising campaigns, but more FUN!